An app can improve upon an existing product or service. 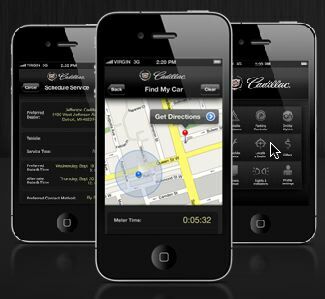 We've discussed Cadillac's MyCadillac app that offers additional service to their existing customers. Another example is the increasing number of banks that allow customers to simply take a picture of their checks in order to deposit them from a mobile device. The key here is looking at your brand's current service/product offering and enhancing it with the service of an app. Tasks and services that naturally compliment your product are the best place to start (GPS functionality for Cadillac-owners). In addition, think about tasks or services that might further enhance your current offering (like the banking example). The crux here is to really look to serve your customers through the ease of an app. Creating rewards for your brand's most loyal customers is a great way to utilize an app. The Starbucks app gives frequent coffee customers the ability to earn "Stars" as rewards towards free drinks and food. Starbucks knows they have loyal customers, so why not reward them for their loyalty? If your brand has a high-frequency rate of purchase with your customers, a rewards-style app might be a great fit. It's a whole lot better than handing out another punch card to put in their wallets. The key is to create a program that your customers will use and benefit from frequently enough to keep up with it. We hope this list of App Goals will help get the wheel of possibilities spinning in your mind. Apps are robust tools that can be an asset to your brand. With all of the app-craze out there, be sure to take some time to weigh the value of creating an app for your brand. If you need some help along the way, we'd be happy to chat about apps! Mobile Apps should be an important consideration in your brand's mobile strategy. Apps are not a solution for every brand, however they can be an asset when properly used. The question many brands ask is: How do we decide if an app is right for us? The key to a successful app is one that enables your users to do something related to your brand quickly and easily. Anybody can churn out an app. However, an app that adds value is a more difficult achievement. There are a number of goals a Mobile App can achieve for your customers. Some apps are specifically geared for mobile shopping. Other apps are simply for order tracking and notification or to help with the decision process. For example, Amazon has a Price Check App to make cost comparisons easy in addition to an app for shopping. We've previously mentioned the Dominos app to order pizzas quickly and easily and Tiffany's Engagement Ring app that allows customers to throughly investigate all of their options. These apps strive to make the a step of the purchase process easier. Dig into your web site's stats to see how many of your visitors are coming from hand-held devices. There may be way more (or way less) than you think. Also, investigate the sales made from these devices--size of each sale, typical items ordered, etc. Really get to know your mobile customer. That way, you can make the tasks he's already doing on your website, easier. The Snow Report App by The North Face helps to create brand loyalty. Many of The North Face's customers enjoy skiing or may be planning a ski get-away. To make their planning easier, The North Face provides an app that gives ski conditions, weather forecasts, trail maps and the ability to post a photo to their Facebook page. And every time the app is opened, The North Face's brand is right there. Like a trusted friend. Get in your customers heads and habits. Think about how they use your product or service and what types of service would compliment that. What are your customers like? Sometimes, creating a picture of your typical customer (demographics, preferences, hobbies, etc) can help with this process. Then, ask yourself how your brand can bring even more service to them. Stay tuned for more Mobile App Strategy Goal planning. Earlier in the week we discussed a Mobile Website as part of your brand's Mobile Strategy. The second major part of a successful strategy includes app development as well. 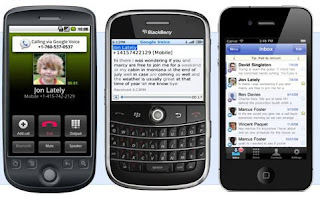 An app is different than a mobile website in that it can interact with a cell phone's functionality. Example: the Facebook App uses GPS in a phone to automatically add a user's location to a status update. If you want a closer look at the differences between a Mobile Website and a Mobile App, check out our Internet 101 blog post. When creating your Mobile Strategy, ask yourself what process you can simplify by allowing users to connect to their cell phone's functionality. No matter the brand of phone, there are a number of functions that are shared by all. Let's discuss them and how they can be used as part of an effective app. Check out the MyCadillac app for a great example of integrating an app with GPS functionality. The MyCadillac app will remember where you parked the car and if it's time to add money to the meter. Also, when it's time for service, you can search for the nearest dealer by your current location. There is no need to stop just at GPS integration, however. Note that, in addition to these GPS-related features, the app also contains relevant information for the user, such as the car's owner's manual, a lights and indicators guide, and access to their OnStar service. Cadillac created an app that would make life easier for their drivers. By recalling parking locations and finding a service dealer, the app is entirely appropriate and usable. While virtually all apps incorporate touch to navigate, few harness the power of touch like Tiffany & Co. Tiffany noticed the growing numbers of mobile sales coming through their online story. Their reaction to it was to create a beautiful, robust tool to help in the engagement ring selection process. In an effort to help obtain accurate ring-size, users can place an actual ring directly on the screen and align it with the correct circle in the guide. In addition, the rings are shown true-to-size and can be rotated, zoomed in on and swapped out with different carat sizes. Tiffany & Co. worked to bring the experience of shopping in-store for an engagement ring to users' cell phones. The design of the app exudes Tiffany's quality and eye for design. 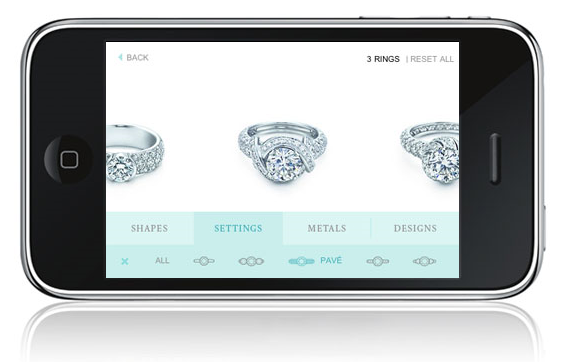 Finally, the app solves a major problem of shopping online--obtaining an accurate ring size. They made shopping simple and easy. The Walgreens app is a robust little creation that has more tools than a Swiss Army knife. We noticed that Walgreens took the opportunity to provide better service to two major functions of their store with their app: the pharmacy and photo processing. App users can scan the bar codes of their prescriptions to order refills or transfer their script to a Walgreens store. In addition, photo processing is made a painless process. Photos on a phone can be enhanced through their photo filters and then added to the cart and ordered to be printed at the nearest Walgreens store. All of these actions are made possible by the phone's camera. The app has some additional features as well, but the takeaway here is how Walgreens has taken two of their core business functions and made them easy for their customers. The app looks to save the amount of time a person would have to spend physically in the store. Google Voice allows you to read voicemail like a text message, which can be handy when you're trying to be discreet. Also, you can send text messages and create custom greetings based on who is calling you. Google Voice connects with your contacts to seamlessly create a Google-fied phone experience. Using existing contact data, Google creates a bigger, smarter experience on a user's cell phone. For better or worse, our cell phones are with us wherever we go--the store, the bedroom and the bathroom even! These devices are also conveniently with us throughout the entire buying process--as we ponder, weigh, analyze and, eventually, purchase any item. 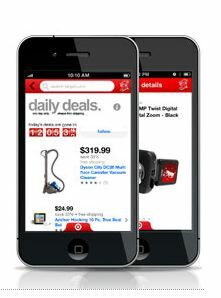 Target looks to assist buyers at varying places within the buying process. From a Daily Deals alert service, to a baby registry, barcode scanner, and shopping list creator, they've made a user's phone an essential asset throughout the buying process. Target worked to meet buyers where they are at throughout the buying process. Whether they're interested in deals, creating lists or wish lists, there's an app for each need. It's time to set out to create a great-app that will benefit your brand and your customers. For your mobile strategy, strive to do one central thing and make it easy for your users. What need can you satisfy? What process can you simplify? What aspect can you enhance? What information are your customers looking for? The examples above merely scratch the surface of app integration. Remember to be creative and put yourself in your customer's shoes. Happy Apping! Mobile browsing is the future--there is no more hiding from that fact. The question before you is, how do you, as a brand, prepare for it? As with any transition in business, a strategic plan will guide you from where you are now, to where you need to be. The majority of your internet audience will be accessing (or trying to access) your brand on a mobile device. They will succeed (and you will, too) or they will fail and then find a competitor that's beat you to the mobile punch. Unfortunately, there is very little gray area here. 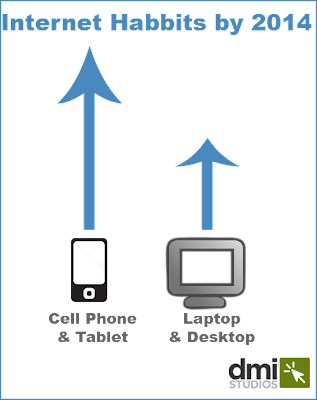 How will you get from where you are now, to a fully-mobile friendly brand? What kind of timeline is your brand looking to achieve? How do you want mobile customers to interact with your brand? Imagining the future will help you to see exactly what you're looking to achieve. When creating your strategy, there are two paths to consider. Today, we'll begin by discussing a mobile website and how it is an important part of your mobile strategy. The question many business professionals have is why they need a modified web design in order to adjust from desktop to mobile screens. 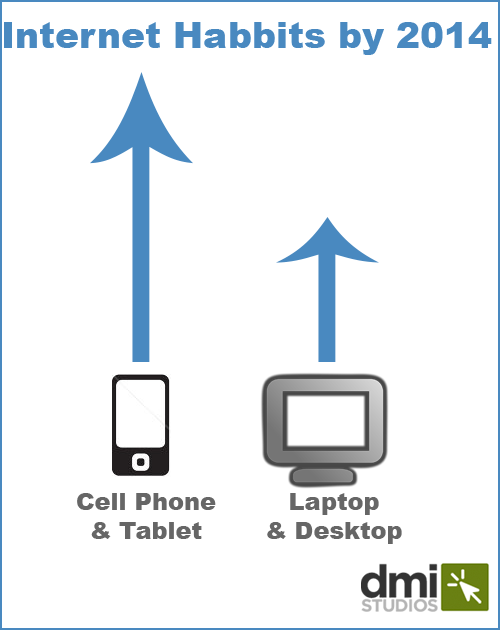 Simply put, the orientation of a mobile screen (phones are way smaller than a desktop) can leave people scrolling up-and-down and left-to-right and zooming in and out on content areas on your current website. The information you want visitors to have primary access to will be cumbersome for visitors to find while scrolling all over the place. A mobile-friendly design makes viewing your website easy on the eyes, whether desktop, tablet or cell phone. In addition, a mobile website can also streamline any processes on your site (say, a shopping cart or signup form) to be quickly and easily filled out, usually in fewer steps, again, making your site more user-friendly. The goal of all of this is to make the experience of your website the best it can be, no matter the technology your visitors are using to come to your site. When creating a mobile website, your team should look through the site and determine the areas that can be streamlined, cut down and simplified for mobile fingers. The goal is helping your audience get to the product or information they want quickly and easily. Interested in some great mobile websites? 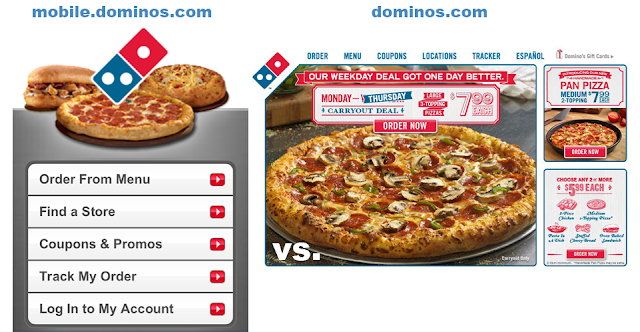 Dominos put themselves in the shoes of hungry consumers and streamlined the pizza ordering process making it quick and easy to become a customer in seconds. Stay tuned as we discuss Mobile Apps later in the week!